Prison S21 and the Killing Fields are regarded as the must-see sites when in Phnom Penh, yet the distance between one another is noticeably long. 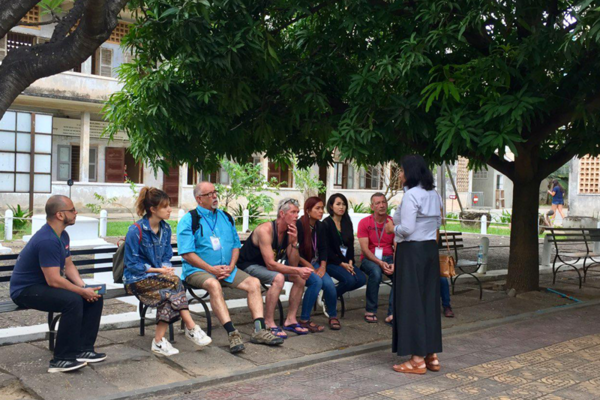 This city tour shuttle bus are equipped with air-conditioner and additional materials that will help you get the most of your visit to these two historical sites. A driver and an English speaking tour assistant will aboard with you to ensure your safety and hassle-free trip. During the ride, there is a recorded English commentary played for everyone about the brief history of the site. Though the tour assistant aboard with you on the bus, he/she is not the tour guide to guide you around during the site visit, but he/she will assist you to get your entry ticket right after your arrival at the place. 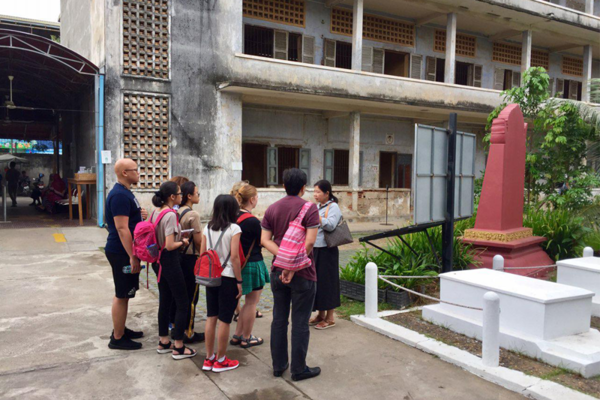 The first stop will be at the Prison S21 ( Tuol Sleng Genocide Museum ), and you have approximately an hour to walk around; there, you can either rent an audio guide or in-house guide at the museum. 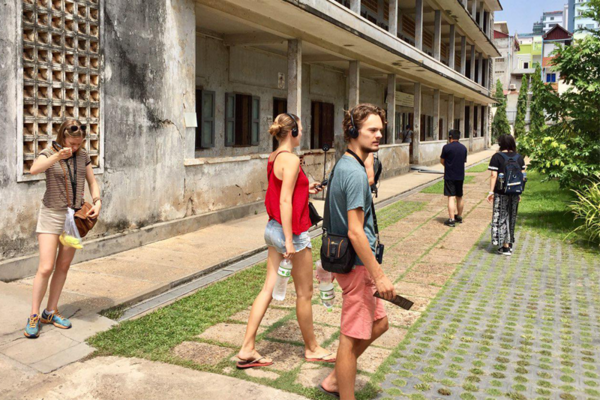 Moving to the killing field, you will spend around 40 min on the bus and during that, a documentary will be showed to give you some highlights about the rise and fall of the Khmer Rouge Regime. At the killing field, you will have around 1 hour and 15 min to explore. Please noted that you have to purchase your tickets by yourself, yet if you have any concern, your tour assistant will always be there to assist you. Once both of the visits ended, you will be brought back to the meeting point or can be drop-off within the shuttle bus‘s pickup/drop-off zone. ✔ English speaking tour assistant. ✔ Separate driver ensures safety and your tour assistant's full attention. ✔ Recorded English commentary on board. ✔ Documentary played on the way to killing fields. ✔ Free wifi & 1 bottle of drinking water. The bus will only wait for 5 min for the pickup. No breakfast/lunch/dinner cover in the tour. The Tour assistant is not your trip guide, he/she will only facilitate your trip. 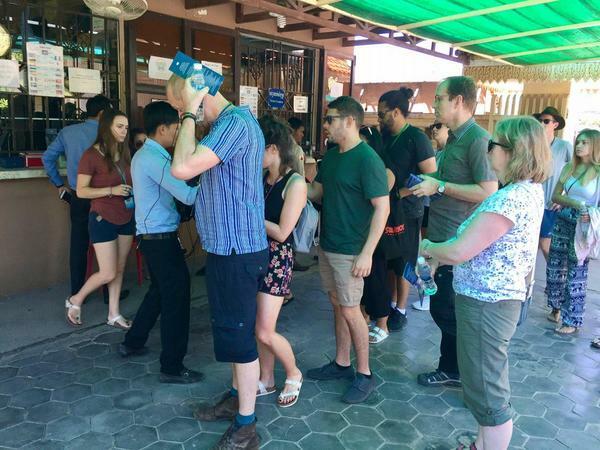 You have to pay for a tour guide at the site if you need one. You have to buy your own entry tickets at your arrival for both places. If you don't request for pickup, you may wait at De Art Hotel Phnom Penh (No 9, 10, 11, 12, 106 Preah Moha Ksatreiyani Kossamak Ave (106), Phnom Penh) for meeting point.